When I think of the first R-rated movies I ever saw, my mind goes to the same two. The first that comes to mind is Gladiator and the second is Con Air. Two very different movies, yet they both have a special spot in the heart of this overly sentimental film geek. 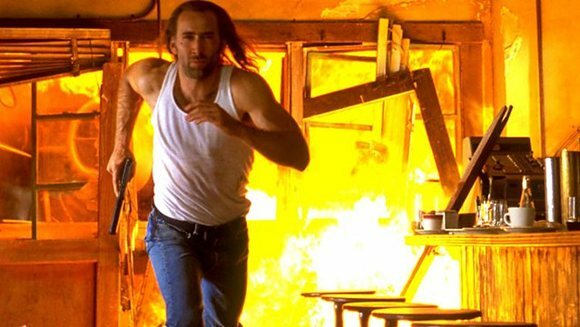 I actually haven’t seen Con Air in a really long time, so I had this fear that it would be nowhere near as great as I remember it being. So, I put it on and hoped for the best. What I got isn’t nearly as spectacular as I remembered it being, but it’s certainly an acceptable and memorable action fest that could’ve used a few more brain cells amongst other things. Cameron Poe (Nicolas Cage) has just finished serving his country as an Army Ranger and is celebrating his return with his wife, Tricia (Monica Potter). That night, Poe gets into a fight with a couple of bar patrons and accidentally kills one of them in self defense. Because of his extensive military training, he is deemed a human weapon and sentenced to 8 years in prison for manslaughter. After quietly serving his time in prison, he’s finally paroled and ready to be reunited with his wife and his daughter whom he has never met. Poe, along with some other inmates getting transferred board the transport plane, which doesn’t get too far until it is high jacked by the psychotic criminal Cyrus the Virus (John Malkovich) and his crew. With U.S. Marshal Vince Larkin (John Cusack) fighting on the ground to get the plane back, Poe is left to his own devices on the plane to stop Cyrus from using the plane to gain his own freedom, while also staying alive long enough to get home and see his family. Like I said, I have very fond memories of watching this movie when I was younger, and while it still has some elements of being a guilty pleasure, I’ve noticed a lot of weird things that I really dislike about it. Before we get to them, I’d like to something I really like about the movie. The cast of Con Air is fantastic. Other than the names I’ve already mentioned there’s also Danny Trejo, Dave Chapelle, Colm Meaney, Ving Rhames, and Steve Buscemi. All of these actors do a fine job in their roles, with Buscemi bringing a really creepy performance as a Jeffrey Dahmer like serial killer that has disturbed me ever since I first saw this movie. The real scene stealer, though, is John Malkovich as Cyrus. Cyrus the Virus has remained one of my favorite screen villains, and this viewing of the movie still holds that opinion to be true. He just oozes with over the top villainy, and it’s so easy and fun to hate this character. I honestly feel like Malkovich is the only person that could’ve played this role, which is odd because it feels so out of place from what he usually does. So while the majority of the cast is really fantastic, there are parts of this movie that are so distractingly terrible, they pull me out of the movie and makes me think twice about what I’m watching. For one thing, I can’t get into Nicolas Cage’s character even though he’s the hero of the movie. There are scenes of his ridiculous long hair blowing in the wind and some really awful lines of dialogue that are so bad, it almost isn’t even funny. But I really can’t totally fault Nicolas Cage for this. Despite what many people think, Cage is a fine actor and has proven so in the past. Con Air isn’t quite a shining point in his filmography. I’d much rather blame the writers for most of the cringe inducing moments. Let’s just say that Con Air is one of those movies that you can only show to the closest of friends in order to save yourself massive amounts of embarrassment, solely because of all the awkwardness and corny dialogue. Honestly, that one paragraph doesn’t really do justice to the amount of negativity that I would have towards this movie if it wasn’t for some really badass action sequences. The fact that a lot of this movie takes place on a plane is enough for plenty of set pieces, but there’s great sequences on the ground as well. Add in an element of time sensitivity, and you got yourself some suspense filled and memorable action scenes. There’s plenty of explosions and gunplay, but what really makes these parts so great are the maniacal villains and their psychopathic nature. There’s plenty of stand out scenes, and it’s funny to say that Con Air was nominated for an Academy Award for its sound design. It’s an example of really well constructed moments of mayhem, and these parts save the movie from being a complete flop. 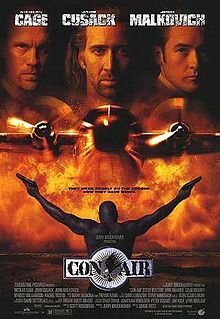 The bottom line is that Con Air didn’t hold up quite as well as it did when I was a kid. I remember all of the characters and the action to their full potential, but I simply didn’t realize how awful some of the writing was. Now that I have more experience with film and how real people talk in real life, I know awful writing when I hear it, and this film is filled with it. As an action movie, it’s memorable for many different reasons, and it’s arguably a good escape from the real world. Objectively, however, it’s got so much going against it that the whole experience can feel kind of awkward.